Want to see something weird? Boot up NBA Live and make sure to install the latest roster update. Now select either the Miami Heat or Brooklyn Nets. Go out to the court, and LeBron James' player indicator now says "King James." 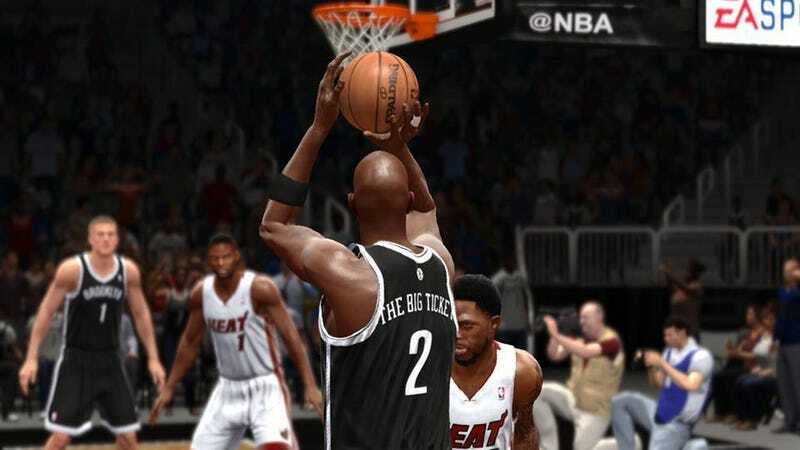 This is part of the kit-bashed way NBA Live, to its credit, added the new "nickname jerseys" option in time for their real-world debut in the Miami-Brooklyn game on Friday night. There's nothing different about the jerseys except the names on the back, and in the player indicator underneath, are now "Dray Live," for Andray Blatche, for example, and "Rio" for Mario Chalmers. Unfortunately, Кириленко is not used for Andrei Kirilenko of the Nets. But the change is more comprehensive than a uniform option. The names show up no matter what threads you choose, and will show up in games you play against other teams, too. Announcers still call everyone by their proper last names of course, but it's still a little weird to see "J. SHUTTLESWORTH" where Ray Allen should be. And, as Pasta Padre notes, the nickname for Kevin Garnett, which I'd never heard before today, doesn't even fit on his shirt.